Smell that turkey roasting in the oven! Get ready to taste that honey baked ham! A favorite holiday has arrived --- no gifts, no costumes, no cards. Just a great meal shared with family and friends. There is a profusion of football games, a first glimpse of Santa at The Macy's Parade, and a true feast... seasoned by memories as much as by spices. Thanksgiving is an intimate affair. Everyone brings their contributions to the gathering and offers to help in the kitchen. The side dishes will be as it always is. Cornbread stuffing. Mom's sweet potatoes. And, Dad's favorite mashed potatoes and gravy. Corn on the cobs. Green bean and other casserole dishes. And somewhere, there will be an odd cranberry concoction of mashed cranberries, orange rinds, walnuts, and jello (possibly a favorite of Grandma's!). Ready in the wings is the dessert. Pies! The homemade pies will always be what family remembers the most. Those completely homemade ones --- crust, filling, and everything pies. Pumpkin, apple, and pecan. Those are always the family favorites... with whipped cream or ala mode! It is on Thanksgiving that we merit eating at the "nice" dining table in the living room. A leaf will be added to extend the surface for additional dinner guests, and then a freshly ironed tablecloth will be draped over it. A tablecloth is special as many of us eat with our plates on place mats. The table will be set with a fine china, polished silverware, and shining crystal glasses that your parents received when they were first newlyweds. Gracing the table will be a centerpiece of fruits, holiday caricatures, and candles. 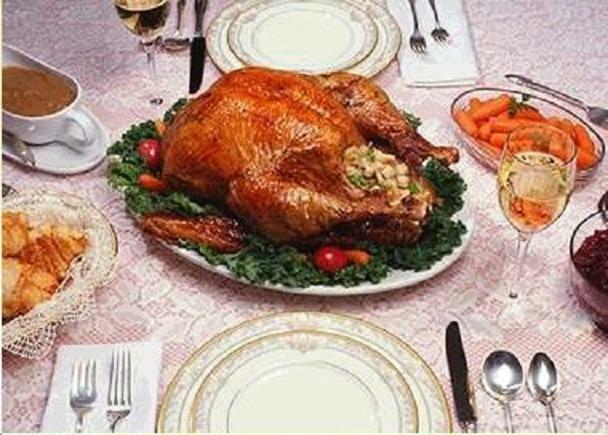 We will all say grace and give thanks for the food, family, and our health on Thanksgiving. But, is once a year really enough? By bringing more appreciation and awareness into our family meals, we strengthen our commitment to each other. Family meals and the traditions we develop around them emphasize the importance of being a member of a family, of feeling loved and being proud of who we are. With today’s family being so busy and so fragmented, meals are a time we can come together. Gathering for meals has gone by the wayside in our hectic attempts to balance work and our personal lives. Many of us remember a routine of family meals during our childhood, anxiously awaiting Mom's call to dinner after a long day. On many weekends, we had the treat of relatives or friends joining us, which prompted special dinners and desserts. In present day, both parents work. The luxury of a home cooked meal before 5 PM is no longer the reality. Two common obstacles are late working hours for parents, and children's activities that overlap with mealtime... such as a soccer game or a scout meeting. It is not always possible for families to eat together. Some times there's no choice. Most of the year, family members just wave to each other as they wolf down leftover pizza. On Thanksgiving Day, we will take a moment to gather around a table... give Thanks to God... and enjoy both food and conversation. This tradition will remind us that we are loved and cherished. If we could only make the other 364 days out of the year like this day, our lives would be so much better.